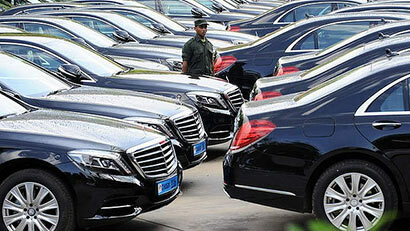 A jinx appears to be affecting the brand new luxury vehicles imported for CHOGM, with at least three top-of-the-line Benz S-400 cars suffering damage last Friday, while being moved around inside the Nelum Pokuna Mahinda Rajapaksa Theatre grounds. Those mishaps were followed by a Luxury bus bringing delegates for the Commonwealth Youth Forum, from the Mattala Airport to Hambantota, brushing against an army truck at Pannegamuwa yesterday. While the bus only suffered slight scrape marks, the luxury Benzes needed some replacement of damaged parts like tail lights, it is learnt. In order to claim insurance, to repair the three damaged cars, sources said the incidents were reported to the Cinnamon Gardens police. The damaged cars were part of a fleet of 54 super luxury S-400 hybrid Benzes brought for the exclusive use of heads of government attending CHOGM. It was not clear whether any action would be taken against the Navy drivers who had been driving them when the mishaps occurred.